"Canine cough medicine options should be limited to antibiotics for bacterial infections or natural supplements. Do not use human medications without the advice of a veterinarian since many are poisonous to dogs." When your dog has a troubling cough, you may wonder if you can use over-the-counter products designed for humans. We recommend not using these as a canine cough medicine without speaking to a Veterinarian first. Human medications that could harm your dog even in low doses include ibuprofen (Motrin, Advil), naproxen (Aleve). Note that acetaminophen (Tylenol) is toxic in large doses and doesn't work well in dogs. If you do select an over the counter product, those with dextromethorphan as an active ingredient are best. Look for Robitussin Maximum Strength Cough Syrup and check the ingredients to be sure that it does NOT contain drugs such as aspirin or acetaminophen, which may be harmful to dogs. In addition, dextromethorphan should not be used in dogs with hyperactivity, allergy to the drug, or if your dog has pneumonia or heart disease. It also may interact with other medications. Benylin is a brand of Dextromethorphan made exclusively for dogs. It is usually dosed at .5 to 1 mg per pound. Doxycycline - The dose is 5 mg/kg by mouth 2x a day for 10-14 days. Plantago lanceoleta: Known as a herbal remedy that is both an expectorant (loosens mucus) and relieves fluid discharge. Bryonia C6: Herbal remedy for the treatment of mucus and dry membranes. Echinacea purpurea: One of the top selling herbs for the treatment of colds, flu and other viral infections. Clinical trials have proved its effectiveness in a variety of settings. Studies have shown that Echinacea works by preventing the formation of hyaluronidase - an enzyme that is known to break the cell barriers between healthy tissue and pathogenic organisms like viruses. This immune boosting herb has also been successfully used to restore immune functioning in patients who have undergone chemotherapy and during recovery and convalescence from major illness. Ferrum Phosphate C6 (Ferrum Phos. ): An important biochemic tissue salts to use when there is any infection or inflammation in the body. It helps to distribute iron and oxygen throughout the body, strengthen cell walls and fight infection. Kalium Sulphate C6 (Kali. Sulph. ): Biochemic tissue salt that helps to distribute oxygen throughout the body. It also aides cell membrane health. Falium Sulphate is known as the 'natural antibiotic' of the tissue salts and together with Ferrum Phos. can treat both the initial, secondary and third stages of infection. It is used for a variety of chest infections, including chronic cough, asthma, bronchitis and even pneumonia. Magnesium Phosphate C6 (Mag. Phos. ): A natural painkiller and antispasmodic and is good for bronchial spasms and other forms of spasmodic cough. 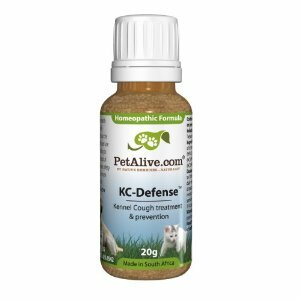 A supportive product formulated with these ingredients is KCDefense. For mild dog cough, vitamin C (5 to 10 mg/pound of body weight) and vitamin E (3 to 5 mg/pound of body weight) could help. Discontinue if the cough doesn't stop in about 2 days. Steep in 1 cup boiling water and remove herbs. For small dogs give one dropper full 3x to 4x times per day. Give 1/2 to 1 teaspoon for large dogs per 20 pounds of body weight, also 3x to 4x per day. If a dog doesn't like the taste you can add a bit of honey.